Indie spotlight is our monthly column on self-publishing. This month our regular columnist, Tim Gurung, chats to Travis Lee about his new book Expat Jimmy, in which he draws on his own experiences of teaching English in China. The novel concerns a young American teacher, who arrives in Wuhan looking for a year-long vacation, paid for by teaching English as a second language. Waiting for him is Adam, a jaded laowai (foreigner / expat) determined to crush his preconceptions of China, and to introduce him to the dark side of expat life. Tell me something about yourself and how you started writing? I grew up lower middle class in the American South. I have always been attracted to reading and writing. When I was a kid I wanted to be a video game journalist; I read Gamepro religiously. Then like most Americans who grew up in the nineties, I read the Goosebumps series. I started writing knockoffs of those tales. I remember convincing my sixth-grade science teacher to read my rip-off of Attack of the Jack O Lanterns aloud in class. In my teenage years I wrote off and on. Same deal with college. I first took writing seriously when I lived in China. What's your writing habit? How often do you write? I write every morning. Sometimes in the afternoon too on my days off, if my daughter takes a nap. On the days I work, I'm up by 0400. Brew the coffee, eat a quick bowl of cereal, fill the coffee thermos, sit at the computer, and say a little prayer and type until about 0445. Then I go to work. I write every day. I get antsy if I take any days off. How do you find writing as a self-published author? The difficult aspect of being a self-published author is a lack of respect. Some people refuse to review eBooks, which in the year 2017 is insane. What do you want to achieve through your writing? First and foremost, it has to be self satisfaction as I enjoy writing, I have to, as I can't make a living off it at the moment. When you wake up before dawn to do something, you'd better enjoy doing it. And I do. If I didn't write...I don't know what I would do. 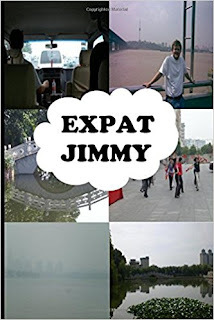 Can you tell me a little about Expat Jimmy, and the challenges of writing it? It’s about someone's first day in China. It has a unique approach and avoids many tropes you expect with China fiction, some of which I've used myself. I hope it’s a book that stands rereading. I think it benefits from multiple reads, which enable readers to make new discoveries. As to challenges, I had to differentiate it from Up to the Mountains, Down to the Countryside, by Quincy Carroll, which also concerns a young American teaching English in China. Next came an issue of authenticity. It helped I’ve lived in China – small details come as come second nature. For example, in an unreleased book, one character greets another on the Chinese instant messaging platform QQ by sending a winking smiley. It may seem like a small thing, but that's a note of authenticity which could only come from living in China. Another challenge involved Adam, who has a difficult backstory. Once the situation in Adam's past became clear to me, I had to figure out how to use it in my novel. The answer presented itself clearly: just show. You can glean enough from the text to know what happened to Adam's wife; you don't know the details, which are not important. The effect it had on Adam matters, and that does raise another question: was Adam always like this? As I said before, Expat Jimmy benefits from multiple reads; Adam's advice about Chinese women takes on a much sadder tone once you're aware of his past. How has Expat Jimmy been received? My best career moments so far have been receiving good reviews for Expat Jimmy from people I respect. Right now, I'm working on a book about a homeless child in Wuhan. Details: Expat Jimmy is available through Amazon.